AAXA has this week added a new addition to their range of pico projectors, in the form of the newly launched AAXA P2 Jr Pico Projector. The AAXA P2 Jr Pico Projector is fitted with a brilliant 55 lumen light engine, a powerful ARM processor, and HDMI and VGA inputs capable of accepting 1080P and WXGA resolution inputs respectively. The AAXA P2 Jr Pico Projector is small enough to fit in the palm of your hand and weighs just 0.3 lbs in weight and measures 4.2 x 2.9 x 0.8 inches in size. 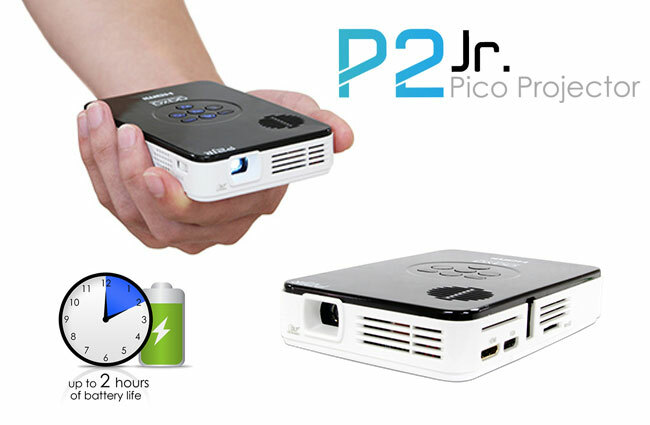 The Lithium-Ion rechargeable battery within the pico projector is capable of powering it forum to 2 hours, and its now available to purchase for $199. For more information on the new AAXA P2 Jr Pico Projector and to order, jump over to the AAXA website for details.